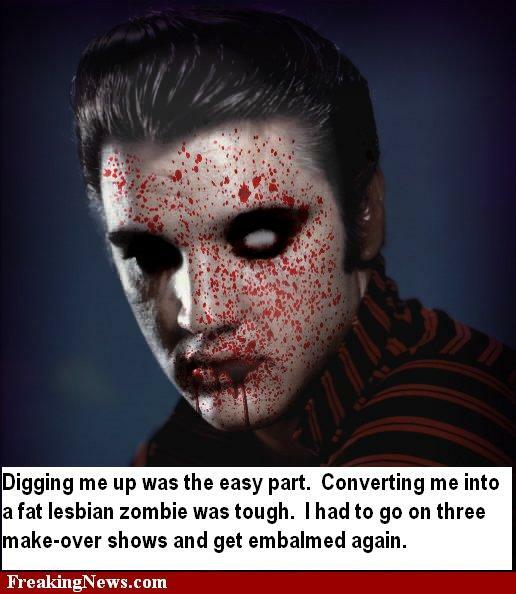 Home → Damien Zone → EXHUMED ELVIS LESBIAN ROBOT ZOMBIE GETS $35K SETTLEMENT OVER CANCELED PROM. A lesbian student who was really an animated doll that which was fashioned from the exhumed reamins of Elvis has been paid $35,000 to settle a discrimination lawsuit the ACLU filed on her behalf because she/he/it fucked up the wholesomeness of a quite country prom by being a big, pushy lesbian zombie. The district also agreed to follow a non-discrimination policy as part of the settlement, though it argues such a policy was already in place but it did not take into account that Elvis would be exhumed and turned into a lesbian robot. 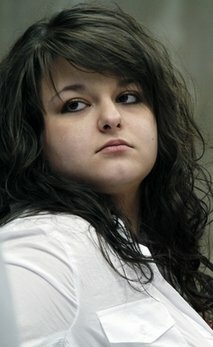 Constance McMillen, (aka Elvis-Tron 3000) 18, said the victory came at the price of her being shunned in her small hometown of Fulton. She left out that the real reason she was shunned was because she was an exhumed zombie who had walked from Graceland and frightened thousands of gentle folk. “I knew it was a good cause, but sometimes it really got to me. I knew it would change things for others in the future and I kept going and I kept pushing,” McMillen said in an interview Tuesday. She can keep pushing for quite some time too because her batteries are designed to last years — months if she eats too much barbecue. The flap started in March when McMillen challenged the Itawamba County School District’s rules banning prom dates of the same gender and allowing only male students to wear tuxedos. The rule also barred exhumed Elvis zombies from attending the prom. The district responded by canceling its prom, prompting the ACLU to file suit claiming the teen zombie’s rights had been violated and demanding the prom be reinstated. U.S. District Judge Glen H. Davidson refused to make school officials hold the prom, but he said in a March 23 ruling that the district had violated McMillen’s rights, and had also made zombies the world over feel fat and unhappy. Eliza Byard, executive director of GLSEN: The Gay, Lesbian and Straight Education Network, said only 12 states and the District of Columbia require school district to have policies recognizing sexual orientation and gender identity and zombie-ism. According to GLSEN, the worst thing a person can be is a teenage, gender dysphoric exhumed zombie or GDEZ.